Successfully Added 4K TV Box Scishion V88 - Quad-Core CPU, Android 6.0, 2GB RAM, 4K Support, Kodi TV, Google Play to your Shopping Cart. 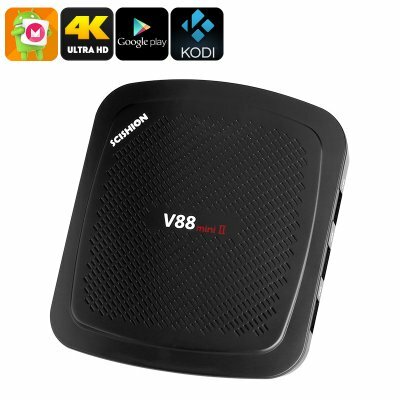 The Scishion V99 Mini II Android TV box offers an affordable you an affordable way to upgrade your HD TV into a full-blown Smart TV and to turn your living room into your own private cinema. Supporting 4K resolution, this affordable 4K TV box allows you to enjoy your favorite types of media in absolutely stunning beauty. Whether you like to watch the latest movies, series, or live sports games – never before were you able to enjoy them in so much detail and vivid color. Additionally, it allows you to browse the web, play games, and enjoy Android applications straight on your big screen TV thanks to its WiFi connectivity. No matter your demands, this 4K Android TV box is guaranteed to put a smile on your face. With its Android 6.0 operating system, this 4K TV box comes packed with the latest software features currently available on the market. Besides its great software, it also packs some sophisticated hardware that allows you to enjoy the most demanding of features. It's Rock Chip 3229 Quad-Core CPU along with 2GB RAM lets you engage in demanding games, applications, and watch 4K movies without dropping a frame. Additionally, the Mali 400MP graphics unit is in place to further increase your overall media experience. This 4K TV box comes with 8GB of internal storage for you to store your latest downloads. It furthermore supports a 32GB SD card slot through which you’ll be able to insert additional external data at any moment. With all this space at hand, you’ll be able to store all games and media without ever needing to worry about running out of memory. Simply head out to the Google Play or use Kodi TV to get free access to millions of the latest applications, games, and movies. With this Android TV box in your living room, you and your family will never have to experience a moment of boredom again. This Android TV Box comes with a 12 months warranty, brought to you by the leader in electronic devices as well as wholesale electronic gadgets..